At TAWI, our focus is not on products, but on providing solutions to your specific needs. Our devoted team of skilled design engineers work closely together with our experienced installation engineers to design and manufacture customised products that meet your specific requirements. 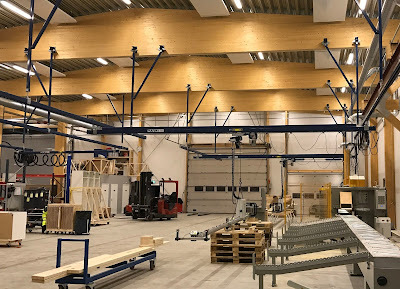 Here is one special solution that our engineers produced for a customer who needed to handle wooden planks up to 10 meters. A TAWIGrip is mounted on a Lyftman steel crane system, installed on wooden beams with extensions and struts to reach the desired level of suspension for the crane system and the tool. The tool, combined with an electrical chain trolley, is equipped with four suction cups and a fully integrated handle. This allows the operator to easily transport the large planks to a saw machine, using the TAWIGrip tool. Easy, ergonomical, and efficient. See the system in action here. Speaking of wood, we have also developed some great solutions for lifting and tilting big wooden sheets, doors etc. With an extended, flexible handle, adapted to the size of the sheet, the operator can easily control the load from a comfortable and safe distance. In this specific solution, the TAWIGrip is suspended in a Lyftman under-braced jib arm, allowing the operator to move their 80 kg wooden doors easily, even though the working area is small and ceiling height is low. The door is gripped and picked up from a vertical position and tilted 90 degrees into a horizontal position. It is rotated 90 degrees in the horisontal plane and then tilted to be placed in vertical position in the rack. TAWIGrip vacuum gripper is an ergonomical solution for lifting, tilting and rotating sheet metal, glass and laminated panels. With a safe, two-handed release function, easy-to-use control board and a light weight design it makes heavy lifting easy. Learn more about TAWIGrip solutions here.